Many things are invaluable to a writer, and one of them is a healthy writing group. Have you heard that before? That’s because it’s true. So what’s a healthy writing group? Members listen to or read carefully the work being critiqued. They mark picky-picky technical stuff like punctuation, obvious misspellings, mistaken capitalization, and grammar mistakes, but don’t take up critique time with them unless those cause confusion of style or meaning. Although each writer has a style, a comfort level when it comes to writing violence or physical intimacy, and a personal sense of humor, no member of a healthy writing group attempts to impose those on the writing of other members. Another invaluable tool for the writer is the ability to accept and use a critique. I’ve seen too many writers argue with comments, questions, and suggestions. What good does that do? By all means, explain your intention if it was misunderstood, but think about this: your intention was misunderstood. You aren’t going to be at every reader’s side to explain yourself, so you’d better improve that bit while you still have the chance. I’ve also seen writers who changed everything everybody ever suggested they change — I’ve been that writer, myself, at times. What I’ve learned about feedback is this: Don’t listen only to other people. Don’t listen only to yourself. Listen to the story. Sometimes the voices outside of your head know what the story needs; sometimes the voices inside your head know what the story needs. But the story always knows. 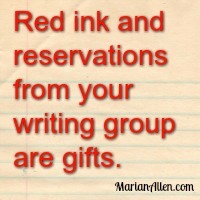 Red ink and reservations from your writing group are gifts you should accept with grace and gratitude. They’re a sign of respect, for your work and for your professionalism. I’m patting myself on the back a bit with this post, because I took a story in to the Southern Indiana Writers and brought the reading copies back thick with red ink and I’ve been dancing ever since. I’m so happy my group thinks enough of my work to want to collaborate on making it better. I’m so proud that they trust me to appreciate the hard work they did in entering into my imagination and helping me shape it. I’m so lucky to belong to a group for whom “good enough” is never good enough. A WRITING PROMPT FOR YOU: A character is given a critique on self or some work and responds to the critique. Who gives it? Why? With what motive? How does the character respond directly or as a result? This entry was posted in SAGE, Writing. Tagged critiques, editing, revision, rewriting, the writing process. Support groups can be very helpful. At least red ink means you have something to work with. I have a few beta readers I trust as much as you trust your writing group, but even they don’t see my writing until it is /ready/. By my definition of ready. 🙁 Part of it is cowardice, I know, but I’m also afraid that showing a story too soon will somehow set it in concrete, at least in my mind. I need to be able to turn a story completely inside out if necessary, and I can’t do that if others have expectations of it. You’re a brave woman. -grin- Like I said, you’re a brave woman! I’ve had CFS almost a decade longer than I’ve been writing. For a while I attended Sisters in Crime meetings, but not their writing group (that required getting there early, and there wasn’t energy for that). I tried a monitored writing group when I first started, over twenty years ago now, but realized quickly that having to keep up with other people’s half-formed work wasn’t possible – they kept changing it! So I’ve gone on my merry way alone, and learned everything I know from writing books instead. Like A.C. Flory, I only show finished work to the world. It’s better that way. I am now a very stern critic of my own work: when it’s not finished, it’s not finished, and I keep asking why not? Eventually my subconscious and I work it out. If groups work for you, and don’t gut you, your work, or your voice, how lovely.